Here's some stuff we found interesting when we were racing around the blogosphere this week! Natalie at Mindful Musings is our new affiliate. We're so excited! She has several awesome bloggers joining in on this. Natalie has her Best Blogger of 2009 poll going on. With so many great bloggers to choose from it's hard to pick only 5! Be sure to vote here before Dec 20. And thank you to several kind folks that have put our name in the hat. Stormi @ Books, Movies Reviews! Oh My! We really appreciate your support especially considering all of the stiff competition! 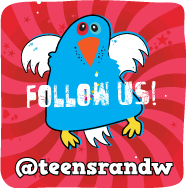 Natalie also has this great Follower Feature where she blogs about wonderful new blogs she has found. This week she highlighted Star Shadow Book Blog and The Cajun Book Lady. We checked them both out and agree that they are fantastic. We think this is a great way to spread the word about other bloggers. You can request that Natalie highlight you too. We were also wondering if any of our followers would be interested in having us do this feature as well. Uhhh, that is if Natalie says it's okay to steal her idea. We'll see if we get any interest. Natalie continued her busy week by guest blogging over at Peace Love and Pat. Her topic? You're Never Too Old for YA. We wholeheartedly agree! Our mom and aunt read YA almost as much as we do! Be sure to check out her great post! Abigail over at All Things Urban Fantasy (love her header and her blog) has a few things going on. - And our personal favorite. 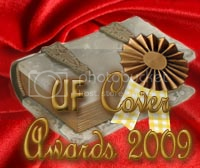 the First Annual Urban Fantasy Cover Art Awards. It's a favorite because Abigail was kind enough to allow Alyssa to vote on the nominees (even listed her as an expert). It's a fun contest for all of us cover junkies. Be sure to go vote here by Dec 30. She's even giving away prizes! Terra from Terra On the Bookshelf took a day off book reviews to provide a great post about being responsible regarding buying pets during the holidays. And you can check out her reviews while you're there! Pat at P eace Love and Pat was kind enough to send me a recommendation for The Pace by Shelena Shorts. Sounds like a great YA urban fantasy. You can check out her review here. 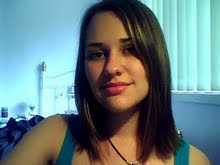 Shelena Shorts is a Goodreads author. You can learn more about her on her Goodreads page. Kristen @ Bookworming in the 21st Century is having a Birthday Bash Giveaway with 25 Winners. Awesome! Love it when there are a ton of people winning. Here's a challenge just for the holidays! Karin at Karin's Book Nook is hosting a Holiday Break Reading Challenge. You can pick as many or as few books as you like and she's giving away prizes. She says: "The librarian in me always wants to encourage reading for pleasure and the holiday break provides the perfect opportunity. 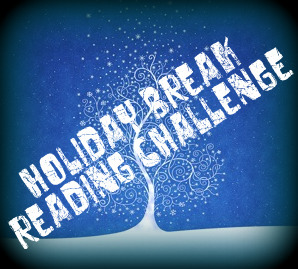 For that reason, I decided to create the Holiday Break Reading Challenge." Just a bunch of stuff we thought you'd find interesting. Have a great day! And FYI - All the Prize Books went out earlier this week. Hey guys thanks for mentioning me! Oh and I'm 26 and adore YA...so yeah I guess I am normal LOL! Thanks you guys for the shoutout. This is a real great meme, way to keep readers up to date on the things going aroung the blogersphere. Is it going to be a reagular thing on your blog??? Thanks for all the info!!! P.S. I just recieved my contest win book. Tahnk you guys. And the bookmark is so cool!!! Thanks a lot for the bunch of links guys ! i'm gonna check them out. Kris - happy to do it. Great blog! Chioma - So happy you got it and glad you like the bookmark! Mariska - enjoy and hope you find some great new ones! Thanks for your support! TJ - So glad to hear it. Enjoy! Chioma - do you (or anyone else) think this should be a regular post? Thanks for ALL the linkage guys! a) I think you should definitely include posts like these every week. They help me to catch up on things I missed all week! b) And of course you're welcome to steal my Follower Feature idea! Lol. I don't mind at all! Natalie - Your welcome and thanks! You continue to add to your reputation as most generous blogger! Such a great post! Now excuse me while I go and check out some of these blogs. Sounds like some really great posts to check out! Terra - your welcome. 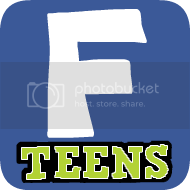 Have fun checking out some new sites! Great newsy post, I'm off to check out some links and yes this gets my vote as a regular post!! What a great post! You go girl! Very creative and thorough! Wow! So much stuff going on and I had no idea. Thanks for the info!